SAIC's highly acclaimed Master of Fine Arts (MFA) in Studio is a 60-credit program that supports creative work, inquiry, and investigation across 12 different departments as part of the advanced preparation of fine arts practitioners. Although the School of the Art Institute of Chicago's (SAIC) Master of Fine Arts (MFA) in Studio program allows you to complete coursework and select advisors from any participating department, your application is evaluated and you are admitted into the program through one studio department. 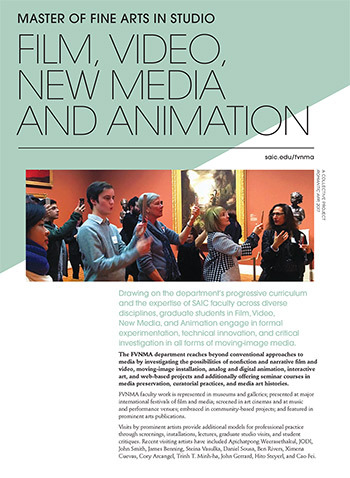 If you are ready to apply to the School of the Art Institute of Chicago’s (SAIC) Master of Fine Arts (MFA) in Studio program through the Department of Film, Video, New Media, and Animation, you will need to first submit SAIC's Graduate Application form and then a corresponding ePortfolio for the Film department. ePortfolios are required for each additional program to which you wish to apply. All submissions happen via the software SlideRoom. Admission to SAIC is for the Fall term only. Write a 500- to 700-word statement that describes your work or research. Discuss how you came to focus on the medium, body of work, or academic area you wish to pursue at the graduate level. Also discuss future directions or goals for your work, and describe how the Master of Fine Arts in Studio (Film, Video, New Media, and Animation) is particularly suited to your professional goals. Upload your statement of purpose to the Attachments section of your ePortfolio. Submit one or more works that have a combined total that is a maximum of 20 minutes in length. Please include your personal contributions if you were a collaborator. You may submit work digitally via SlideRoom by providing a Vimeo link to your work or uploading the file directly into SlideRoom. Please do not link your video through any application other than Vimeo. With departmental approval you may also submit other formats via mail: digital tape format, i.e. SD or HD mini-DV tape; analog formats such as 16mm film prints. Include a portfolio inventory list that indicates the title, size, running time, date, medium, your explicit role in the production (i.e. Director, Cinematographer, Script writer, etc.) and any other pertinent information about each piece. Work on analog formats must be queued to its starting point. If not in English, please include English subtitles. We no longer accept DVDs. Although every precaution is taken to protect portfolios, SAIC cannot accept responsibility for loss or damage. Original portfolios will be returned following reviews. Do not submit envelopes or stamps for return mailing. The Department of Film, Video, New Media, and Animation conducts interviews by invitation only. Applicants who pass the preliminary review will be invited to schedule an on-campus interview in February. Notification will be sent by late January. The Master of Fine Arts (MFA) program at the School of the Art Institute of Chicago (SAIC) is designed to offer maximum flexibility in addressing your individual needs as a student. Following admission through a department, you will design your two-year plan of study based on optimizing the offerings and opportunities available throughout SAIC. You are encouraged to seek out curricular advising as needed from a variety of available sources including the dean, graduate dean, graduate division chair, department heads, academic advising, the graduate admissions office, and your peers. * Students who wish to use an alternative venue or presentation outside of these options must receive permission from the Dean of Graduate Studies. The AIADO Department encourages students in their MFA design programs to participate in the AIADO and Fashion Graduate Exhibition. Completion schedule: You have a maximum of four years to complete your MFA in Studio degree. This includes time off for leaves of absence. Students will have access to studios for four semesters only. Transfer credits: You must complete a minimum of 45 credit hours in residence at SAIC. You can request up to 15 transfer credits at the time of application for admission, which are subject to approval at that time. No transfer credits are permitted after a student is admitted. Art History requirement: MFA students are required to take ARTHII 5002 Graduate Survey of Modern and Contemporary Art OR ARTHI 5120 Survey of Modern and Contemporary Architecture and Design. Art History courses must be at the 4000-level and above. Undergraduate studio courses: Graduate students are permitted no more than one undergraduate studio course (3000-level and above) per semester without permission of the Dean of Graduate Studies. Courses at the 1000 and 2000-level are allowed only with permission. MFA 6009 Graduate Projects advising, an ongoing individual dialogue with a wide range of full-time and part-time faculty advisors, is at the heart of the MFA program at SAIC, encouraging interdisciplinary study across the curriculum. You are required to register for one MFA 6009 Graduate Projects advisor each semester, and we highly recommend you register for two. In the registration process, you may elect to earn 3 or 6 hours of credit with each advisor. This option is designed to allow for maximum flexibility in designing your program. You can earn as few as 3 and as many as 6 credits with each advisor each semester, thus dedicating a maximum of 12 credit hours to your studio activity. The number of credits you earn has no correlation with the length or frequency of the advising sessions or to faculty assessment of student work. The remainder of credits required for the full-time 15 credit hour load may include graduate seminars and academic or studio electives. MFA students are urged to take graduate seminars, and an introductory seminar in their department of admission is highly recommended. In addition, the MFA student may choose from all the art history, studio, and academic offerings across the curriculum (including undergraduate offerings above 3000 level) in any given semester to customize their degree experience. As one of the principle means of assessment each semester, you will be required to participate in Critique Week, a week-long schedule of critiques during which classes are suspended. Fall semester critiques are organized by department with panels representing the discipline. This provides you with an opportunity to understand the department’s expectations, have your work reviewed from a disciplinary point of view, and to reiterate the expectations for graduate study. Spring semester critiques are interdisciplinary, with panel members and students from across SAIC disciplines. Interdisciplinary critiques allow for a broad range of responses to your work, and are intended to assess the success of your work for a more general, albeit highly informed audience. Critique panels include faculty, visiting artists, and fellow graduate students. At the conclusion of your studies, you will present work in the SAIC Graduate Thesis Exhibition, other end-of-year events at SAIC, or the Gene Siskel Film Center—or arrange with the graduate dean or division chair for an alternative thesis of equal professional quality. Each year more than 200 graduate students exhibit work, screen videos and films, and present time-based works, writings, and performance to a collective audience of 30,000 people. Students wishing to install work around prevalent themes, strategies or stylistic affinities can participate in a juried and curated section of the SAIC Graduate Thesis Exhibition. A faculty and staff committee conducts extensive studio visits and as a collaborative project with student participants, organizes and installs the show in designated space at the exhibition. MFA students are advised to understand the expectations of their faculty when enrolled in undergraduate studio classes. Although graduate students are an asset to the group dynamic, faculty requirements for graduate students in undergraduate classes are variable. The student is responsible for understanding the faculty member's expectations about completion of assignments, attendance, and any other criteria for earning credit. To assure that graduate students are working at degree level, they are permitted no more than one undergraduate studio course (3000 level and above) per semester without permission of the dean of graduate studies. Courses at the 1000 and 2000 level are allowed only with permission. Students have the distinct advantage of gaining in-depth knowledge and competence in a single field of specialization or acquiring advanced competencies across multiple fields of study. We encourage our MFA Studio students to move beyond their home departments and work with faculty and peers in any area that supports their graduate work and research. Graduate studios for MFA students are spread across campus in clusters that allow for robust interdisciplinary exchange. Graduate-level courses and topical seminars support individual studio work by exposing students to the larger dialogues around the production, exhibition, and function of art as well as its expanded cultural production and reception. Students design a personalized curriculum by choosing from a wide variety of seminars, courses, and graduate advisors linked to numerous studio, design, and academic departments. Graduate critiques, central to the MFA experience, alternate between discipline-specific panels in the fall semester and interdisciplinary panels in the spring semester. The purpose of the graduate studio program is to prepare students to enter into their chosen fields of practice or to pursue their unique professional pathways as independent artists or cultural practitioners. It is a rigorous and demanding degree in ways that often exceed the boundaries of the studio. As important as demonstrating perfection of technical skills, articulate communication, and conceptual acuity is a student's ability to demonstrate insight, independence, and a generosity of spirit. Each of the studio departments at SAIC has a distinct, but porous, culture. Our extraordinary faculty and facilities are at the core of the MFA Studio program, but the exceptionally talented student body drawn from national and international contexts is what makes graduate study at SAIC unparalleled.